There is an old word for women who believe they can overturn fate, and the word, as an adjective, is “weird.” (Remember, in Macbeth, the “weird sisters.”) This was also the word, as a noun, for fate or destiny itself, and is now the word, as a verb, for alienating others. What makes the new David Lynch so weird, and at the same time traditional, sometimes ancient, is its ever more delayed, more inevitable reckoning with fate. 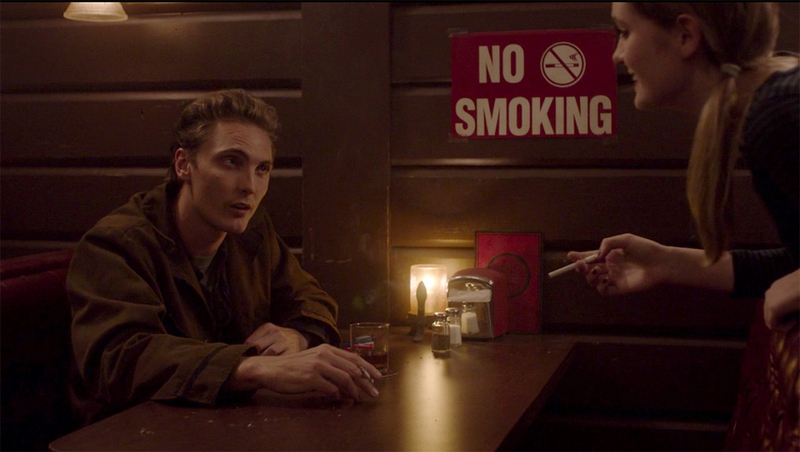 Things in Twin Peaks have a way of turning out badly, and for women those ways are more predictable. “Blue Rose,” the designation lent by FBI Regional Bureau Chief Gordon Cole (David Lynch) to the few, weird cases we see him handle, seems to imply that the cases are unsolvable, or that the solutions lie in the paranormal. But in the case of Laura Palmer, what was left unresolved was something very physical, very sick, between her and her father. If biology is not destiny, and neither is identity, we can split the difference: it’s family that destines and thwarts us, family that buries the evidence for what we can and can’t do, and family that decides, still and so often, where we end. Twin Peaks: The Return, 2017, still from a TV show on Showtime. Season 3, episode 5. Richard Horne (Eamon Farren).